Q: Isn’t This Really Just Entertainment? In a word: NO. All of David’s presentations are entirely content-driven. Q: How Can a Presentation be Both Great Fun and Content-Driven? It would be lying to say that David’s events aren’t lots of fun. And this is part of the reason for his effectiveness (see below), since he is able to engage those who might not be enthusiastic about participating in most types of mental development training. But David’s presentations are always content-driven, combining his internationally-renowned skills as a teacher of applied cognitive psychology with your choice of material. plus hundreds of pages of articles on leadership and influence. Q: My Group is Facing Serious Issues. Is David Able to Help with REAL Problems? ...and a variety of other companies and governmental or nonprofit organizations facing rapid social, regulatory, technological, or “competitional” change. Q: Are the Workshops for Management or Line Level Employees? David regularly creates leadership training presentations for all-CEO groups such as the Young Presidents Organization, as well as Peak Communication™ workshops for entry-level phone service representatives. Often, he will work with an entire company, from newest employee to middle management to CEO — a great opportunity for team-building and mission alignment. Q: Does it Really Sound Good? Yes! 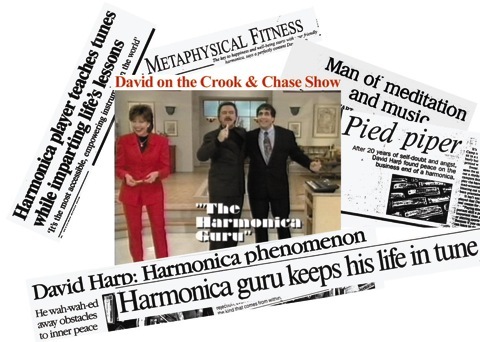 The harmonica is the only instrument that is always “in harmony” (that’s why it’s called the “harmony-ca”). As long as the group is breathing correctly — and David makes sure of this with his Harmonica Hand Signal Method™” — it sounds great. And the more, the merrier! You haven’t really lived until you’ve heard thousands of brand-new harp players playing Beethoven’s Ode to Joy, or a Chicago Blues! Listeners (from other groups, hotel guests, etc.) often break into spontaneous applause when walking by — no kidding! Q: Does He Do Festivals? Company Picnics? Although David’s events are content-driven, he is glad to do “entertainment” events which feature strong inspiration and motivational themes (and which David will help create). He has entranced a number of large “festival-type” groups, with thousands of participants, although he hopes to “do a big one, one of these days.” He has even been inveigled into doing a wedding, with 250 guests toas.ting and roasting the bride and groom with blues songs, created in advance with David’s help. Q: Haven’t I Seen David Somewhere? It’s possible. In addition to his dozens of books, available in bookstores around the nation and the world (and with his face on the back), David has been featured many times on the QVC channel, as well as Good Morning America, The Evening News with Peter Jennings, The Crook and Chase Show, National Public Radio, and on lots of local tv shows, and in national and local magazines and newspapers.